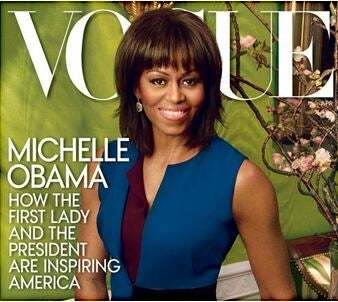 RUSH: Moochelle Obama is featured on the cover of the latest Vogue magazine. Have you seen it? She looks hot on that cover, Snerdley, you have to admit. I don’t know what your thoughts on the bangs are, but Moochelle looks hot, and then there’s this paragraph: “The president and the first lady and all that they are doing to inspire Americans,” and I about choked at that. Because, if anything, that’s not what they’re doing. There’s no inspiration coming out of the White House. There’s no uplifting anything, practically from anybody in Washington. There isn’t any uplift. There isn’t any inspiration, motivation. Everybody’s doom and gloom. I remember one day I was watching Oprah and George Gilder was on. Do you remember George Gilder? George Gilder was a philosopher, a writer, a social scientist, a number of things. He had written at the time — this is the late eighties/early nineties — a number of tracts on the relationships between men and women, their relationship to culture and society and how women, in his view, were civilizing. It was women who determine the outcome of a culture by the choices they make. He basically said something like that. Oprah threw him off the show! She threw him off the show because it was an insult to women for him to say that they “civilize” men. He didn’t mean that men were a bunch of brutes and apes running around. What he meant was that women bring out the best in men, keep them focused and doing what their intended job is: Being fathers, providers and all. She just blew a gasket! I don’t know that she’s ever thrown anybody else off the show. So I read this encapsulation of the Vogue story. What does Barack say? “Michelle Makes Me Tidy Up, admits Messy President Obama — ‘And what Michelle has done is to remind me every day of the virtues of order. Being on time. Hanging up your clothes. Being intentional about planning time with your kids. '” Obama said exactly what George Gilder said — and in Vogue, she’s praised and he’s praised. Oprah out of the White House and off of the campaign! Don’t forget that. RUSH: Obama says in that Vogue story, “No doubt I’m a better man having spent time with Michelle.” George Gilder got thrown off the Oprah show for saying stuff like that. RUSH: Dave in Lake Tahoe, California. What a gorgeous place this is. Welcome to the program. CALLER: Yes, sir. It’s an honor to talk with the man behind the golden microphone that I’ve been listening to most of my life and learned so much from. RUSH: Well, thank you very much. I really appreciate that. CALLER: I wanted to bring something to your attention that really concerns me. It was brought to my attention by a US Marine. His name is Peter Santilli. Have you ever heard of Peter? He’s an outspoken Marine that doesn’t want to be told what he has to do by the military but what he thinks is right for our country, and he informed me that they’re grooming Michelle Obama to enhance Barack Obama’s dynasty for two more terms. I wanted to get your opinion on that. 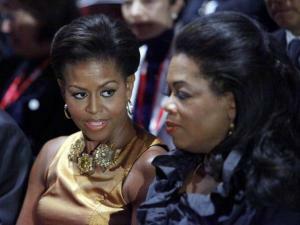 RUSH: Well, first, who is “they” are grooming Moochelle, who is “they”? The Democrats? RUSH: Well, let me ask you a question. RUSH: Obama’s second term ends early in January 2017. Do you see Michelle going to Hawaii with Barack and sitting on the beach eating bonbons? CALLER: Yes, I do see that. RUSH: Well, then you don’t think she would run. RUSH: Oh, no, I’m thinking permanently. I’m thinking 2017, okay, we’ve done this. We been there, done that. Time now to go to the Obama Institute for Social Justice in Honolulu and sit on the beach and eat bonbons. CALLER: Yes. I was amazed when I heard this, because I never even thought of that concept, but when I read it on — he actually has a website if you want to have one of your producers look at it. It’s called PeterSantilli.com. RUSH: Well, we don’t have producers here, but it was just yesterday that I, El Rushbo — E-l-R-u-s-h-b-o dot com — mentioned the Democrats are already floating a dream ticket of Hillary-Michelle for 2016. So there’s no question that it’s being toyed with and pondered. I mean, Hillary must really be into ’em for a lot if that were to happen. But these people are about power. These people are all about lifetime power. I wouldn’t be surprised. I wouldn’t be surprised if Michelle is being groomed for this. Nothing at all would surprise me on that. The Democrat bench, I mean there really isn’t one. Everybody focuses on the Republicans and what bad shape they’re in, but somebody tell me what the Democrat bench is, Hillary? I mean, with all due respect, by the time 2016 comes around, that’s 30 years of Clintons. I mean, that’s not exactly a youth movement. And that’s why I can partially believe it. Thanks for the call, Dave.